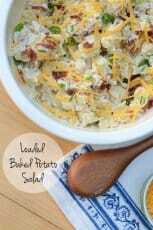 This Old Fashioned Potato Salad recipe is my version of the classic American potluck dish. Tender potatoes with a creamy, perfectly seasoned dressing. This fail-proof recipe is one of my old favorites! There are a lot of varieties of potato salad out there but this one is straight-up, old school, summer party in the backyard potato salad. 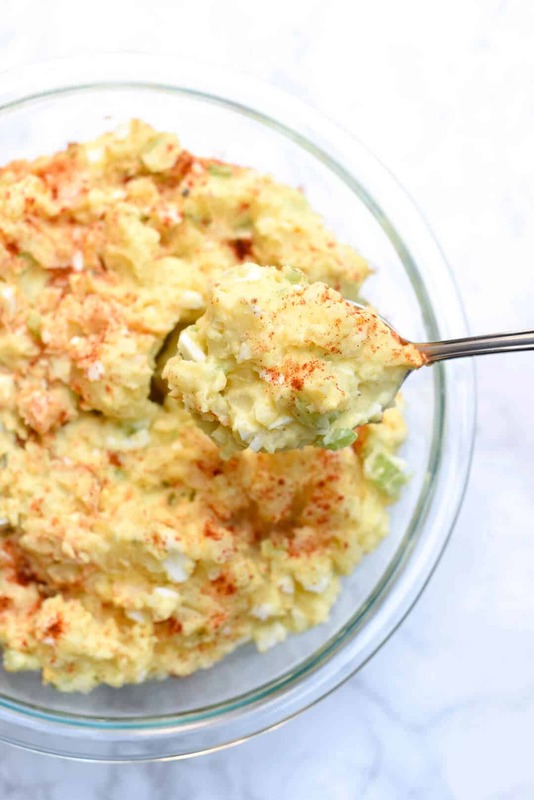 I grew up eating and LOVING my sister Barb’s potato salad and this recipe is a take-off on hers. I’ve made just a few slight modifications over the years and I’m happy to say that the result is wonderful. Barb has a knack for potato salad; one of her many talents in the kitchen. She never measures anything so getting her pinned down on a recipe can be a bit difficult but I took it upon myself to press her on this one and thank goodness I did. It just can’t be beat! 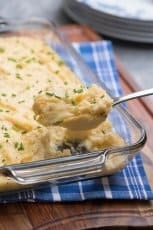 This recipe includes what I think is the precise ratio of dressing to potatoes, a vital element to any good potato salad. Although I rarely measure my produce at the grocery store, I make an exception when buying potatoes to make this salad so I can get that perfect ratio every time. The simple ingredients include 3 pounds cooked, cooled and chopped Yukon Gold potatoes, diced white onion, and diced celery. It’s important to dice the veggies to distribute all that flavor and get the appropriate texture in each bite. Once that is combined it’s tossed with the dressing and chopped hard-boiled eggs. 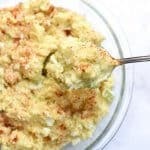 My sister always uses russet potatoes and although they are less expensive, I just can’t stress enough how fantastic Yukon Gold potatoes are for potato salad. So, so worth it. There is no need to peel the potatoes before you boil them. Drop them into a big pot, cover them with water and bring it to a boil. Reduce the heat a little, cover the pot, and let the potatoes simmer at a low boil for 20 to 25 minutes, until tender but not falling apart. Drain off all the hot water and immediately rinse the potatoes in cold water until cool enough to handle. At this point, you can use paper towels to pull the peels right off. So much easier than peeling! 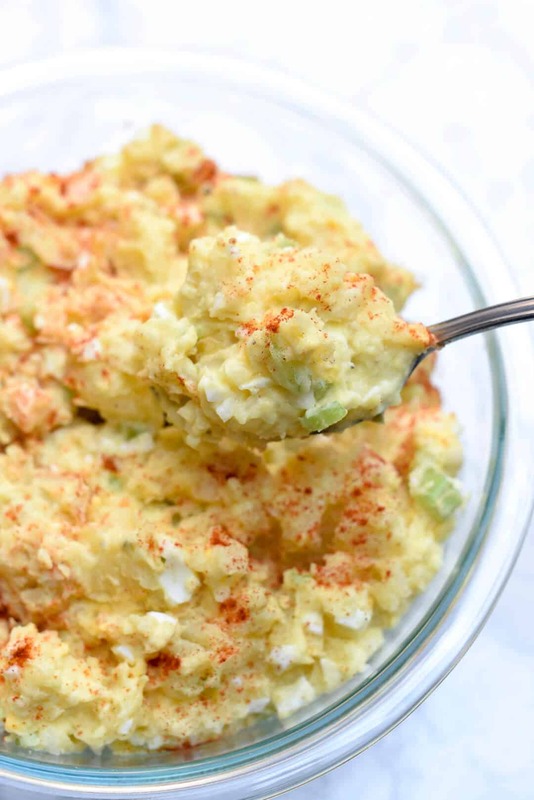 The dressing is what really sets this apart as Old Fashioned Potato Salad. It consists of mayonnaise (the real stuff), a little yellow mustard (not too much! ), sweet pickle relish, celery salt, a little regular salt, and fresh ground pepper. That golden hue you see in the image above is exactly what you want. One of the areas I’ve strayed from Barb’s recipe is the sweet pickle relish. She adds an entire jar! I get that not all of you are as crazy about sweet pickles as we are so I’ve used just 3 tablespoons here which adds a mild, but not overwhelming sweetness to the salad. If you are not a fan, you can substitute dill pickle relish, but for me, it’s got to be sweet! 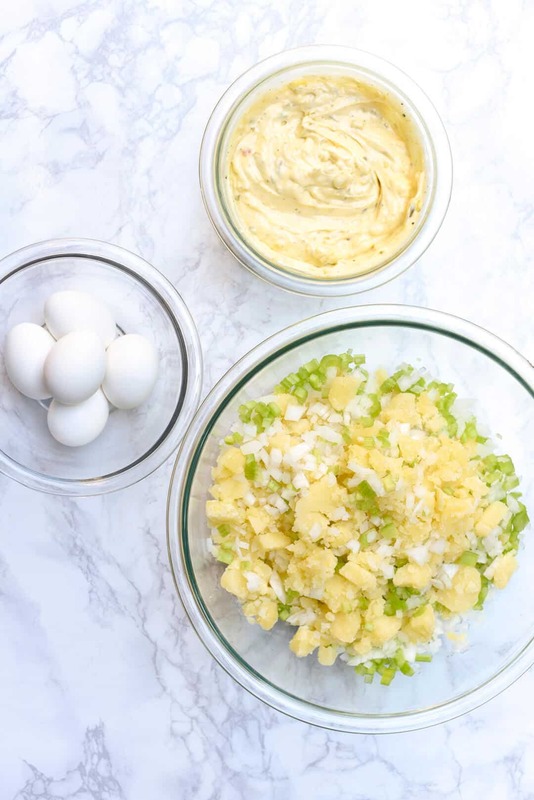 The chopped, hard-boiled eggs are added last and lightly tossed with the dressed salad. Take a look at my detailed instructions for Perfect Easy to Peel Hard-Boiled Eggs and be sure to plan ahead so they’ll be ready to go. Sprinkle it with a little paprika and refrigerate it for at least an hour to be sure it’s nice and chilled. Be sure to check out the recipe card below for some variations on this recipe. It’s fun to mix things up a little! Add unpeeled potatoes to a deep pot that has a cover. Add enough water to cover the potatoes and place over HIGH heat. 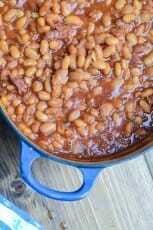 Bring water to a boil, reduce heat to MEDIUM, cover the pot and cook at a low boil for 20 to 25 minutes, or until tender when pierced with a sharp knife. Drain and immediately rinse potatoes with cold water until cool enough to handle. Use paper towels to pull the peels off the potatoes and chop into small pieces. Combine chopped potatoes, diced onion, and diced celery in a large mixing bowl. Season with 1/4 teaspoon salt and toss to combine. In a small mixing bowl combine mayonnaise, mustard, celery salt, pepper, and pickle relish. Add to potato mixture and gently stir to combine. Fold in chopped hard-boiled eggs. Taste and season with additional salt and pepper, if needed. Sprinkle with paprika, cover and refrigerate for at least an hour or more. For the best flavor I don't recommend using light mayonnaise for this recipe. Use traditional mayo or the canola oil version is wonderful. 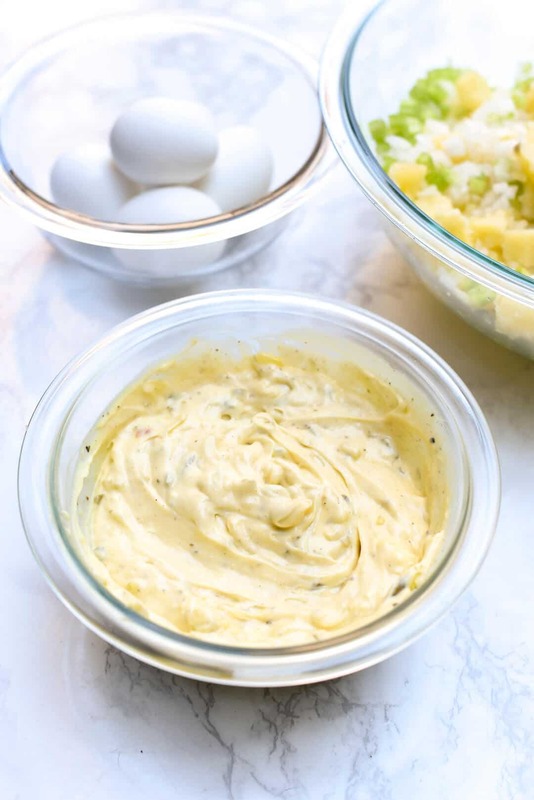 You can make this the night before but be aware that the dressing tends to be absorbed as the potato salad hangs out in the fridge so if you want it really creamy, you can reserve a small portion of the dressing to stir in just before serving. Don't like sweet pickles? Substitute dill pickle relish. If you really love sweet pickles (like me!) try adding more relish, to taste. My sister, Barb, adds an entire jar! If you have fresh herbs on hand they are delicious in potato salad! Try adding a few pinches of any of the following - dill, chives, basil, or parsley. Try substituting Dijon or whole grain mustard for the yellow mustard for a different flavor profile. Every now and then Barb would add green peas! Try stirring in a cup of thawed (previously frozen) green peas. It may sound odd but it adds some nice color contrast and texture to the salad. Be like Barb. I need easy, healthy , no dairy chicken crockpot recipes. We just moved and all I have for the next 4 weeks is a fridge and a crock pot. HELP! This is how we do potato salad in the South. Duke’s mayonnaise or Hellmans? 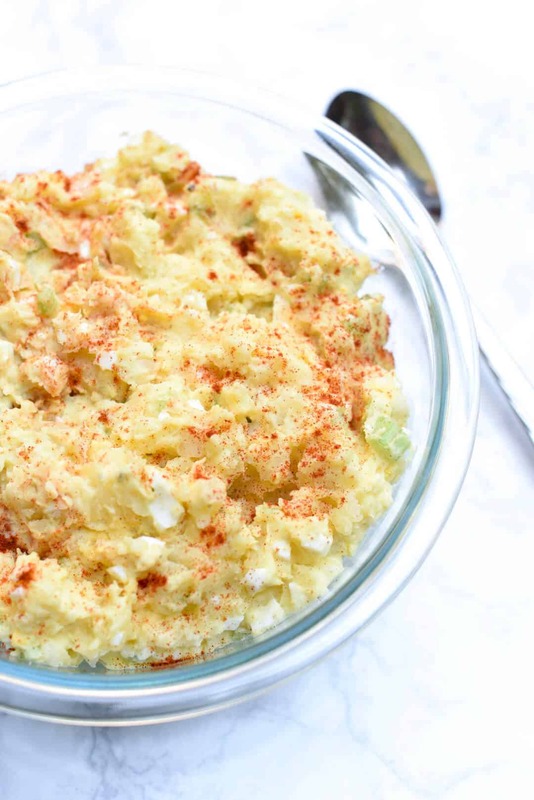 Hellmans is my favorite mayo, but Duke’s makes a yummy potato salad. Hi Sharon. I’m on the West Coast and we don’t have Duke’s but I believe that Hellman’s is called Best Foods here in California. I use Best Foods and love it but I’d sure love to give Duke’s a try. A must-have at any BBQ! Looks delicious! I’m making this for my picnic this weekend! Potato Salads never get old. Especially when it looks this yummy. Oh, my, this looks like a most delicious potato salad! LOL about the jar of pickle relish—I think your adjustment is perfect! 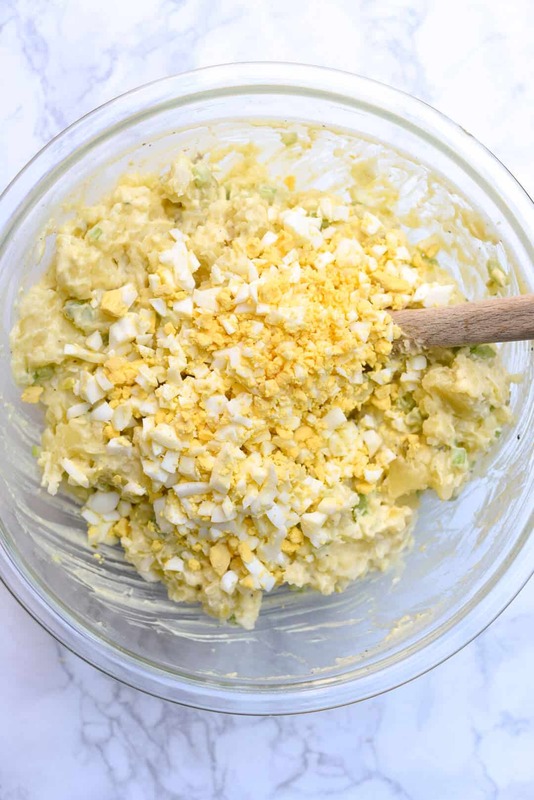 I love all the ingredients you included in here and in the dressing, especially the eggs! Potato salad always has my heart! 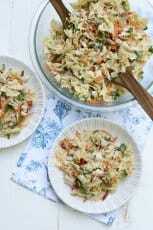 Hands down one of my favorite summertime salads. It’s not a BBQ without potato salad. I don’t use the whole jar of relish but close! Y’all, Try this: Use dill instead of sweet relish and add diced sweet apples. Delishous, I promise!